VIDEO FLASHBACK: “Siskel and Ebert Holiday Gift Guide 1993”! Flashback twenty years to watch this special from 1993, featuring movie critics Gene Siskel and Roger Ebert offering their recommendations in the best in home video and electronic gadgets offered that holiday season. The computer and gadget stuff is especially fun to watch. Remember CD-ROMs? Audio: John Williams Music From THE ADVENTURES OF TINTIN! Do you love John Williams? Are you excited about the upcoming Tintin movie? If you answer “yes!” to one or both of these questions than this is the video for you. It features nine minutes of selected audio clips from John Williams soundtrack for the film. Hit play. Close your eyes. And enjoy! 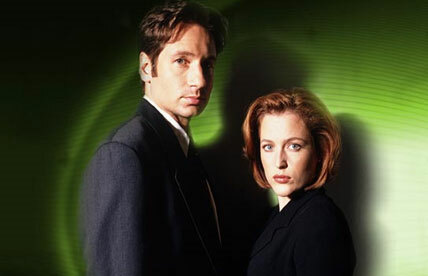 According to Horror Express, and other sources, Gillian Anderson confirmed that long rumored X-Files 3 should be out by 2012. The actress also confirmed the project is likely to be direct to DVD. We welcome this. Not only because we’re huge “X-Files” fans. But we disliked where the last film left the franchise. We’d love to something a bit more upbeat and open-ended. Labor Day DVD and Blu-Ray Sale (40% Off)! If you’re a fan of rare and obscure genre movies, you probably already know about VCI. They make available a wide variety of rare titles on DVD and Blu-Ray with the best transfers they can muster. And many of their titles are only available through their website. And they really do have great stuff. Cult movies, classic serials, crime and detective, b-westerns, obscure British films, science fiction, martial arts, UFO/paranormal and much, much more! One problem: They can be a bit pricey. But for a few days that problem is solved. Because they’re having a 40% off sale from now until September 6th in honor of Labor Day! Yup, you read that right: 40% off! To participate all you have to do is enter the coupon code “laborday40”. Obviously without the quote marks. To get start shopping now, visit the site here. You’ll be glad you did. Here’s a new trailer for one of the most hotly anticipated horror films of the fall … The Woman. Savage, bizarre and wonderful. That and more is what this film has to offer. Video: RISE OF THE PLANET OF THE APES! Fascinating behind the scenes featurette on the some of special effects in the new hit film Rise of the Planet of the Apes. Those folks at WETA sure are masters at what they do! Video: THE WOMAN IN BLACK! One of the creepiest horror films trailers in quite a while. If the film is even a tenth as good as this trailer we’re in for quite a treat.